Jordana is one of those US drugstore brands which is much overlooked at ol' Walgreens, that establishment of value-seekers like myself. I believe a selected range of Jordana products can also be found in some parts of Asia (I know Singapore carries some of them), but they're not worth buying in Asia as they're way overpriced. But in the US, they're a cheap and cheery brand, and they actually have some very good items. 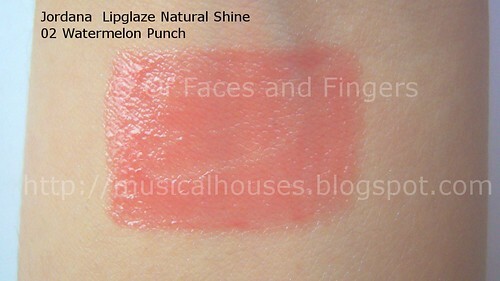 Case in point - the Jordana Lip Shine Natural Glaze in 02 Watermelon Punch. These come in little click-pen dispensers with a brush at the end, a la the Stila lipglazes. These are also half the size of your typical Stila Lipglaze, but they're also definitely less than half the price, so I'm guessing value-wise they're still better. Jordana has two ranges of Lip Shines, Natural Glaze and Shimmer Glaze, and from what I hear, the Natural Glazes are way better than the Shimmer Glazes, which tend to be too frosty for most people's preferences. 02 Watermelon Punch happens to be a gorgeous coral colour. It's a pretty universal shade, so I do think that anyone could wear it. There isn't any shimmer or glitter in this one, which suits my preferences just fine. I also like the semi-sheer, jelly-like texture of the lipgloss - it's not as pigmented as I usually like my glosses to be, but it shows up enough for me. It probably wouldn't overwhelm girls who don't like too much pigment either, since it's semi-sheer - I guess it's a happy in-between. 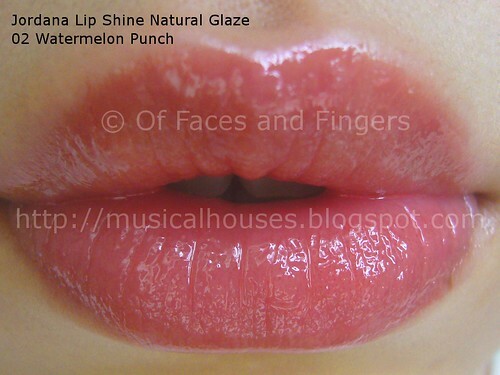 As you can see on my lips, it also replicates that jelly-like, semi-sheer texture, producing a very glossy finish. I quite like this, really. I just wish it was a bit more pigmented, but at least it's not totally sheer. The Jordana Natural Glaze range actually reminds me a little bit of the Rimmel Vinyl Glosses. So do you need this? If you do happen to be passing by a Walgreens and see this lying around, I think it'll be worth grabbing a couple. It's cheap, cheery, and actually pretty good. @Winnie: I've never actually tried the VS glosses, although I've heard they're pretty good, and they're not actually too expensive! If you're in the US, this product is pretty cheap - I don't remember it being more than a few dollars. Probably around US$2 if I remember correctly - so it's REALLY worth getting at that price! Jordana glosses are hard to find in Canada too but I will be keeping my eye out..this is a beautiful color! I bought some of the little lipstick thingies from Jordana - Easyshine? Something like that - and a couple of the eyeshadows a few weeks back in a Cherry Culture sale, just to try the brand. They were all about $2US each, and then with 20% off for the sale, so I didn't really care if they turned out to be duds. I quite liked them though, the quality is not too bad for something so cheap. Not sure if you can even buy it here in Australia - I've never seen it anywhere. nice lip swatch!! i love the color! wish it was more widely available! great post! please check out my beauty & fashion blog :) i followed!! follow mine if you like! @Beauty Style Addict: I think Jordana is carried in Canada, but I'm not too sure. Their website jordanacosmetics.com does ship to Canada though! thats so pretty ... shame they dont sell them in the UK! ooh! I love the lip shiner and it looks awesome on you. gotta grab that one. OH SO PRETTY! Love the color! It's like a perfect juicy mix of peaches, watermelon, and everything good!